As part of WHS’s Aspirations Day every Year 11 student had the opportunity to take part in a mock interview. 53 business volunteers, representing a wide range of sectors, gave up their morning so that every one of the 311 students had a chance to practice a formal interview. Students e-mailed their CVs in advance to their designated interviewer, and they attended school on the day in business attire in order to replicate a real job application. With the scenario set, our young business professionals looked suitably anxious and excited entering the Sports Hall, in readiness for what was the first ever interview experience for many. When they left the room after 25 minutes of questioning the relief and pride was evident, many grinning from their feedback. And what brilliant feedback they received! All of the interviewers present had lovely things to say about the young people that they had just met, adding that they had represented the school very well and done themselves proud. Our thanks goes to all of the volunteers who gave up their time to make Mock Interviews possible. Every student has gained incredibly valuable experience and it will be hugely useful when they are seeking future employment or courses. 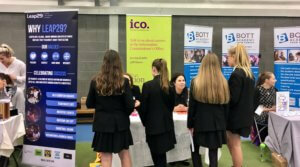 This year’s Aspirations Day, also included the WHS Careers Fair. This popular event sees many local businesses, national and international companies and all of the local Further Education colleges taking the time to talk to our students and let them know about opportunities available when they are making decisions about their future. 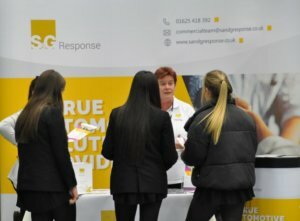 Many businesses brought along Apprentices who were able to talk to students about their experience of the world of work. Students in Years 8-11 were timetabled to attend so that they could inform themselves about apprenticeships, the qualifications required for different jobs and the wealth of opportunities available for them. The Olympic Hall was buzzing with interested students and all the representatives were complimentary about the attitude of the students and the standard of the questions they asked. With so many local business people involved in the Aspirations Day, the Business Partner Programme hosted an informal lunch and networking session. Over 60 businesses attended taking the chance to meet each other and to see how their contribution to Wilmslow High School is making a difference. Dr Pullé thanked everyone for all of their contributions on the day and Mr Vincent stressed how the school was looking forward to further developing our current business partnerships as well as forging new links.